Wireless M-Bus (868 MHz) centralization complies with the standard EN 13757. The consumption data may be sent remotely or in walk-by mode. 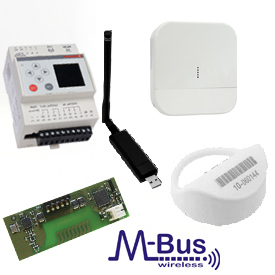 The new modular M-Bus Wireless centralization system is composed of a datalogger GE552Y052 (with integrated web server) and Wireless data receiver antenna GE552Y053. - connecting in series the various wired and wireless devices, extending the reading capacity up to 500 devices. - directly managing 500 wireless devices or 20 wired devices and 480 wireless. The number of wired devices may be extended to 250, connecting more local concentrators GE552Y050 to the GE552Y052 datalogger, maintaining the possibility to manage up to 250 wireless devices. Wireless M-Bus/M-Bus datalogger for acquisition, processing and registration of data from wired or wireless M-Bus devices. Manages directly up to 500 wireless devices and 20 wired devices. Wireless repeater and concentrator to extend the radio range of the devices and for data transmission to the GE552Y052 datalogger. To be used with the software for data acquisition GE552Y056. * The code refers to no. 1 user licence. Data sent to a PC, received by antenna GE552Y043 connected to USB port. Wireless data receiver for devices installed on the system (heat cost allocators, wireless modules for meters). Can be connected to PC via USB port. Range up to 400 m.
The operation is provided by the same software GESWY001 used for heat cost allocators programming. GE552Y016 - Wireless module for water meters. GE552Y027 - Wireless module for thermal energy meters. To be installed on the thermal energy meter GE552Y215, GE552Y216, GE552Y217. GESWY001: software to manage and set the Wireless centralization system. * The code refers to 1 user license.